Summary: Bilingual third grade students acted as helpers to first graders in a collaborative writing workshop. 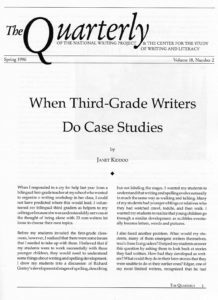 The third grade teacher guided her students through a process similar to teacher inquiry–to reflect on their own experiences as writers in order to help the younger writers, to take notes on their experiences as teacher/tutors, and to carefully think through the problems encountered and results obtained in order to improve their practice. This article models three useful practices in a writing context: 1) students as researchers; 2) older students as tutors to younger; and 3) reflective practice in writing and teaching. Looking back at my students’ notes a year after this experience, I found that these novice teacher-researchers had faced the same kind of problems and made the same kind of discoveries as their adult counterparts. Like adults, the young researchers were sometimes dismayed by how little their students knew. “Yo aprendi que los ninos de primer grado no saven escrivir muy bien” (I learned that first graders don’t write very well), said Daniel, a very logical third grader. I responded with a plea for understanding. “Son muy jovenes!” (They’re very young!). And while it may have taken these third graders a while to adjust to these beginning writers, they also came to realize that their students made more progress when they were encouraged rather than criticized. Irma wrote, “[I did] not say anything mean because that would have made the first grader feel bad.” The mentors came to aprpeciate small steps: “Ya está mejorando poco a poco” (He is improving little by little).